Here's a review of free Linux Gerber file viewers. 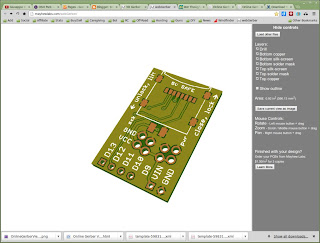 PCB fabrication shops usually require Gerber files of your latest PCB design. Taking one last look can prevent mistakes, so you'll want to view the designs graphically with a Gerber file viewer. Windows users have quite a few options which I've previously reviewed. For Linux users the choices are very limited but here's my review of the available options. It's possible some of the problems I encountered are fixable. If so, please let me know in the comments. gerbv is a free, open source package that's part of gEDA's suite of tools. One downfall is that it cannot open zip files, which is usually what I send to the PCB fab. 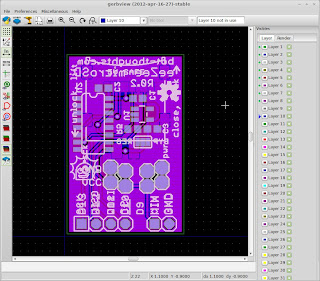 Several display options are possible as with KiCAD. Viewing bottom layers through the top layers is possible in Normal rendering mode. I had to adjust layer colors to be able to see, for example, the bottom silkscreen. Otherwise it displays drills correctly, the UI is quite good, and it has a good set of features. It's one of my go-to Gerber Views on Linux despite the niggling issues. 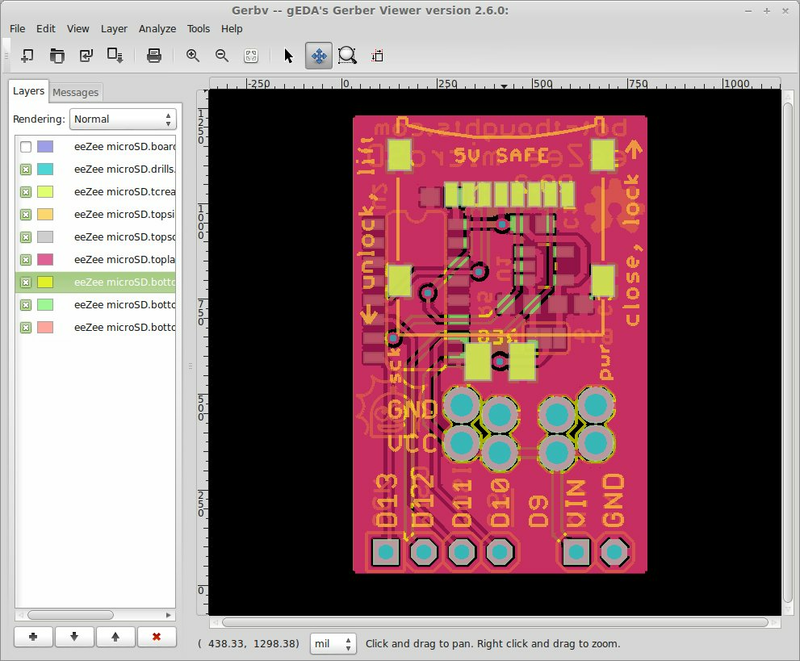 gerbview comes from KiCad's free, open source suite of free tools. Tip: don't display dcode numbers; they're distracting and slow down zoom. Layers can be shown or hidden as with many Gerber viewers, but they are unnamed (Layer 1, Layer 2). If I want to turn off the bottom copper layer... which one do I hide? The tool only recognized my Excellon file, not my dri file. I also had to select "all files" as it is expecting a .drl extension. Zooming seems haphazard and difficult to control. Centering the design doesn't actually center it. It puts the lower left corner in the center. The UI has some nice display options. It's my second favorite and would be my first if the layers were named descriptively and the zoom/center issues were fixed. 3D Gerber Viewer is a free, online Gerber Viewer that displays your board as a 3D object that you can rotate and zoom. The performance is excellent. It was able to display my Excellon drill file and rendered holes correctly. The downfall is that it requires drag and drop of all your Gerber/drill files at the same time. For me, those files are mixed up with a bunch of board and schematic files. I'd rather click-select files from a dialog. Zip support would be ideal. I'd also love to see improvements in detecting which file corresponds to which layer. But despite these shortcomings, it's a decent tool and I'd recommend it. gerber-viewer.com is an online version of the EasyLogix GerberLogix tool for Windows. While the Windows tool is wonderful, I found the online tool to be frustrating, particularly the zoom feature which was extremely slow and difficult to use properly. I encountered an issue where every additional file loaded adds to the list of layers. Clicking "clear all" removes all layers. An earlier problem with drill display has been fixed. Circuit People's web offering is usable but only just so. It reads zips or multiple files which is nice. 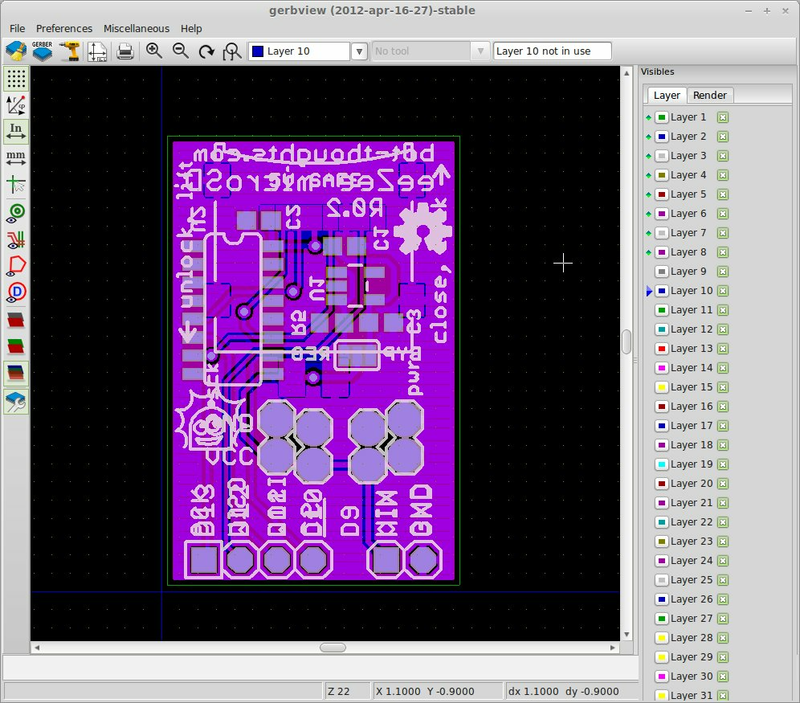 Unfortunately, it wasn't able to render my Excellon drill file (what I send to OSHPark), and it doesn't display an overlay view of all the layers at once. This latter feature is required if you want to check for alignment and overlap which I do. In short, it's just not useful enough compared to the alternatives. Note that the review was performed on my 3.4GHz quad core, AMD Phenom II X4 965 on a Gigabyte GA-78LMT-S2P motherboard with built-in GPU. Mint 14 is my installed OS. Here are screenshots from my favorites. The circuit being displayed is my eeZee microSD board. Good one question is posible print to eps format of this software?.